For your diving holiday to Zanzibar, the Arabian Nights Hotel offers excellent value, directly on Paje beach with bar, swimming pool and walking distance to local restaurants and PADI 5* Dive centre next door. Ideal for all levels, gentle lagoon to thrilling drift dives, wreck, pristine coral and mantas! Depart 05 March 2019 – LAST MINUTE from £899pp (SAVE £200). For your diving holiday to Tobago, the Shepherds Inn offers excellent value, on site restaurant, bar, swimming pool, beach and walking distance to local restaurants and sandy beaches. Superb drift diving, wrecks and more. Ideal for non-divers too! Departs LAST MINUTE November, early December 2018, February, March, May, June 2019. For your diving holiday to the Phillipines, the El Galleon Diver resort is popular with divers and non divers alike. 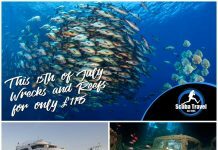 With a PADI 5* DCD Dive centre and jetty on site plus pool, spa, restaurant, sociable bar and 30 excellent dive sites – critters, reef, wrecks + more! Depart LAST MINUTE November, early December 2018, February, March 2019. 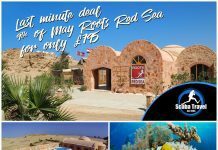 For your diving holiday to Oman, the Sifawy Boutique Hotel is 40km south of Muscat with onsite PADI dive centre, swimming pool and all day dining restaurant. The dive centre is located at the hotel with pristine dive sites on offer. Depart May 2019 – LAST MINUTE November/December 2018 from £1,095pp. For your diving holiday to the Maldives, Equator Village on Gan Island is an excellent value island with an onsite restaurant, bar, swimming pool, beach and PADI scuba diving centre and Mantas galore! Departs LAST MINUTE to June 2019. INDONESIA from £1,499pp SAVE £100 including 15 dives! Tasik Ria Resort Manado North Sulawesi – Indonesia. 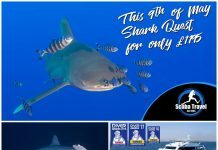 10 Nights FULL BOARD from £1,899pp SAVE £200 INCLUDING 16 Dives! 5 Nights Full Tasik Ria, Manado and 5 Nights Full Board Dive Into Lembeh. INCLUDING 16 dives tanks, weights. Departs LAST MINUTE to June 2019. (Limited availability). UK based scuba diving specialist tour operator. Next articleStay in the Holiday Spirit!